A product containing pure sap from the Croton lechleri Muell Arg. plant, called Sangre de Drago – Dragon's Blood by the Indians of Peru. It has toning, antiviral, antibacterial, antimycotic, and anti-oxidative effects. The product stimulates the development and maturing of the connective tissue. It activates blood production and cellular immunity, and has specific effects on the spleen, helping to heal and regenerate wounds, tissues, mucosa and skin. It facilitates regeneration and increases the immunity of the organism. The product is suitable for any animal species. - A natural antibiotic product (may be applied directly to wounds) [Kingvet]. - For long-lasting infections, resistance of the pathogen to antibiotics [Kingvet]. - In cases of fever [as per localisation 1 of the Pentagram]. - Healing of all types of wounds (internal as well as external application) [Kingvet]. - It acts as an immunomodulator – it subdues pathological immunity and activates physiological immunity [Regavet]. - During convalescence for the recovery of affected organs [Kingvet, Gynevet]. - A specific product for leucosis (leukaemia) [Korovet]. - It helps to join wound fringes together – helps to minimise scars [Kingvet]. 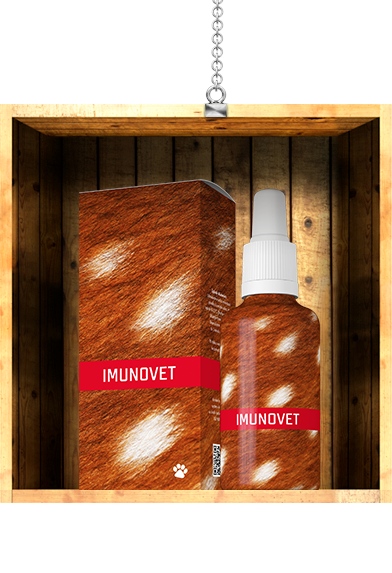 - Adjunct product for tumour conditions [Cytovet]. Shake before use. Administer in small amounts of water or in titbits after feeding. It is recommended to use the product within three months of opening. Irritant for empty stomach – astringent effect. Always administer during or after feeding. Store the product in dry and dark environment, at 10-25°C. Do not freeze. May solidify in the bottle upon contact with water. I use Imunovet practically after any surgery. It helps also in cases of bacterial agent resistance to antibiotics. An effective product for the healing of all wounds, including infectious ones.